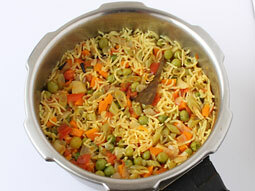 Vegetable Pulao (Veg Pulav) is a spicy rice dish prepared by cooking rice with various vegetables and spices. In this recipe, assortment of spices, veggies and rice are first sautéed in oil and ghee and then cooked in pressure cooker as you would cook plain rice. 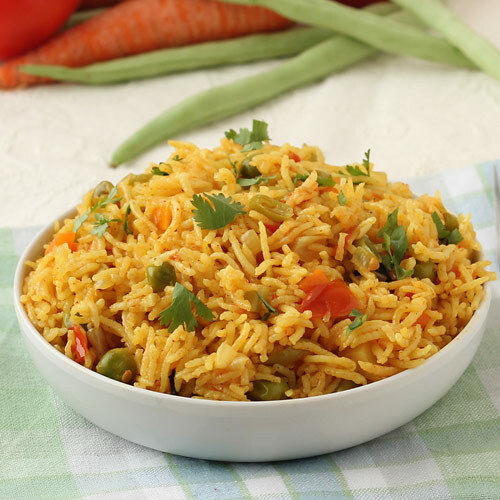 However, the uniqueness of this easy mixed vegetable pulao recipe lies in use of bay leaf, cinnamon and cloves which provides nice and complex aromatic feel that simply makes juices flowing in mouth. Wash rice and soak it in water for 15-20 minutes. Drain and keep aside until needed. Heat ghee and oil together in a pressure cooker (2-liter capacity, stainless steel cooker) on low flame. Add bay leaf, cinnamon, clove, and sauté for 30 seconds. Add onion and sauté until it turns light brown or for approx. 2 minutes. 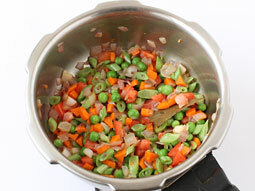 Add chopped tomato, green peas, french beans and carrot. Stir-fry them for approx. 2 minutes. Add soaked (drained) rice, garam masala powder, turmeric powder, red chilli powder and salt. Close the lid and cook over medium flame for 2 whistles. When 1st whistle is completed, reduce the flame to low and cook until another whistle. Turn off flame. Let it cool at room temperature until pressure inside cooker comes down naturally. Open the lid carefully and fluff the rice with a fork. Transfer it to a serving bowl and garnish with fresh coriander leaves. 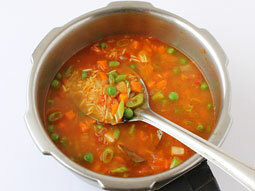 We have used 2 liter capacity stainless steel cooker in this recipe. However, you can use larger size of cooker as well but you need to determine how many whistles and what flame intensity will be required to cook it properly. 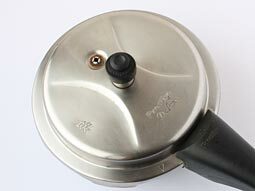 If you are using pressure cooker made of aluminum then cook it for 2 whistles on medium flame. You can prepare it in large quantity in larger pressure cooker. Just use rice and water in 1:2 ratios. i.e. for every one cup rice two cups water should be added. You can also prepare equally delicious mixed vegetable rice pulao in a pan with a lid. Use same amount of ingredients as mentioned in this recipe, cover pan with a lid and cook it on low flame for 8-10 minutes. Do not open the lid in between while cooking. After turning off the flame, open the lid after 7-8 minutes. However, cooking in a pan may require more water as steam will escape easily, hence add 1/4 cup more water for given recipe. Serving Ideas: Indian vegetable pulao is traditionally served with cucumber raita or onion raita, papad and pickle. In south Indian states like Andhra Pradesh, Kerala, Karnataka and Tamilnadu, it is served and enjoyed with coconut chutney. It is a perfect dish for bachelors to make for dinner. Can I cook the pulao without any bay leaves, or cloves as I don’t have any of them. I have cinnamon and Elachi but no bay leaves and clove. Can I add some ginger and garlic crushed for flavour, will these additions make a vast difference? Response: Yes, you can cook pulao without bay leaves or cloves and you can add crushed ginger and garlic. It doesn't make much difference in taste. I just saw the blog and fell in love with it. My vegetable rice is cooking. Can you tell me if the chilli powder you refer to is an Indian version (also known as cayenne) or is the blend we Americans buy premade that we also use in meat chili that contains paprika, oregano, cumin, onion powder, etc. Response: Hello Carrie, the Indian version red chilli powder (cayenne) is used in all the recipes on this site. This chilli powder is the ground form of dried red chillies. Going to try this recipe. Easiest recipe for starters. Thank you for sharing. Does the second whistle in low flame take a long time. Mine is taking forever and I am getting scared whether it is getting burned. Response: Hello Veena, it takes a few minutes for second whistle. It might take more time if the bigger pressure cooker is used. I tried this for the very first time and it was very delicious. I had never cooked anything in my life but this recipe was simple and very useful . Good recipie, but what about cardamom ? and mint leaves do they find place somewhere? Response: Hi Dephan, This recipe doesn't use cardamom and mint leaves. Can this recipe be made in a cast iron Dutch Oven instead of the pressure cooker? Response: Yes, you can use Cast Iron Dutch Over to Vegetable Pulao in it. We recommend to pre-cook vegetables in steam for this. Excellent. 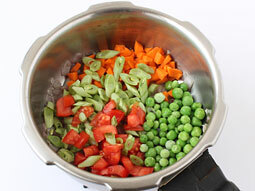 We are planning to prepare vegetable veg pulao. We have invited our close relatives. Txs. I've tried this recipe today and came out perfect, I didn't add cinnamon and in place of garam masala I've added chicken masala as it was a side dish of chicken curry, thank you and I'm going to try others recipes. Awesome thanks again this recipe. Awesome recipes i had tried one of them and my family loved it. Nice. I really like this simple pulav recipe. I really like this simple pulav recipe. I tried to cook puval for the first time and it turned up to be delicious. Thank you so much...... I tried this and it was awesome.... Thanks again. Thanks a lot ! I cooked nearly after a decade. I chose this recipe. My wife and kid liked it so much. foodviva...you made me day! Are there any tips you can give for using a rice cooker with this recipe? Response: Hello Tricia, I have never used the rice cooker so I am not able to give you any tips. Excellent way to teach preparations by using photos, step by step to make the job easier. Awesome food. Never tasted such a food before. Its really awsome... step by step photos made it so easy. I tried and it was perfect as explained... I love this. Followed the same mentioned in this. Came out well. But there were little sticky may be because of water ratio. Except that came out very nice.. Most of my family members liked it.. Response: Thank you Chitra for trying the recipe and writing the feedback. When you try this next time, add less water to make non-sticky rice. If I need to double the quantity of rice, do I need to double the rest of the ingredients, including spices, proportionately? Response: Yes, you need to double the ingredients. Nice recipe. Came out very tasty. Can I use potato in vegi? Response: Yes, you can add potato with other vegetables. I tried it as per the proportions mentioned here, turned out yummy with nice aroma. 1/2 cup rice means how much gram? Response: 1/2 cup rice means 100 gms of rice. Thanks for this recipe. Very good. Thanks for nice and easy recipe. The best rice dish ever. A must try. Garam masala already has cinnamon and clove. Why add them again in this recipe in whole form? Also, your recipe doesn't call for the garam masala to be friend with onions. Will this not leave a "raw" taste? Thanks in advance for your reply. 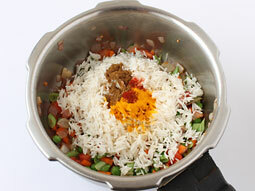 Response: Garam masala has cinnamon and clove but whole cinnamon and clove gives strong flavor to the pulao. No need to fry the garam masala in oil because the masala is be cooked with rice in next steps, so it will not taste raw. 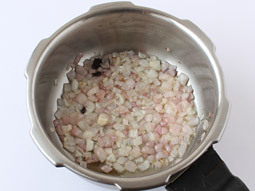 This is sweet and simple method of making a pulav. Very helpful. Awesome recipe, my mom said wow. Do I need to boil the rice first? Response: Hi Fatema, no need to boil the rice first. It was fabulous having it, my mother loved this recipe. Excellent recipe hardly took 20 minutes. Thanks a lot. Can't wait to make this recipe, but can you share the cooking time in minutes. I don't quite understand how long is 2 whistles. Sorry. Response: If you have never used the pressure cooker then I suggest you to follow the instructions completely (like amount of water and cooking over medium flame) and do not change any ingredient ratio. Two whistles means when two times pressure cooker whistles completed. You can also cook it in a pan, follow the same method and cook it for 10-12 minutes over low flame in covered pan or until rice is cooked (for detailed direction to cook pulao in a pan follow this recipe of palak pulao). Simply superb and excellent pulao. Thanks for the recipe. First time when I cooked it was awesome and my husband loved it. Second time, rice got sticky. How did it happen? Response: Hi Anjali, follow the given tips to make non-sticky rice. 1. 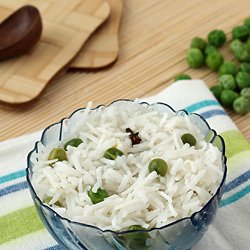 Always use basmati rice for pulao. 2. Wash the rice at least 3-4 times or until water is clear. 3. Do not add more water. 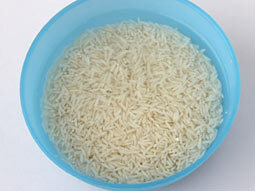 For 1/2 cup rice use 1 cup water or follow the instructions given on the backside of rice package to get water amount. 4. Do not cook it for longer period because we have already soaked the rice. 5. Do not forget to stir fry the rice for around 2-minutes in step-6. This is very nice recipe. First time I cooked and it was really tasty. Thanks a lot. My husband just loved it. Thank you so much. Followed the procedure and it was very nice. Very good, thanks for such a nice and easy recipe. It’s really yummy and tasty. It’s easy to cook and make family happy. I loved it. Yummy, how to prepare paneer pulao? Response: Hi zara, check our pulao section to make the various types of pulao and rice dishes and follow the given link to make paneer pulao. Simply awesome and delicious. Just loved it. Please share some tricks of how to keep it fresh to be consumed after 4-5 hours. Response: Hi, pulao remains good for 5-6 hours at room temperature and for a day in refrigerator. Just reheat it in the microwave or in a pan before serving. Excellent - followed the recipe and results were good. Used the frozen mix of vegetables with corn, and microwaved the veggies in water for 4 minutes before putting in the cooker and came out well. how to make it more spicy? Response: To make spicy pulao, increase the amount of red chilli powder (as per your taste) and add 1-2 chopped green chilli in step-3.